What version of Microsoft Excel do I need to use the Templates? All our templates are compatible with Excel 2007 and later versions. If you have compatibility issues please contact us. What version of Microsoft Word do I need to use the Templates? All our templates are compatible with Word 2007 and later versions. What version of Microsoft PowerPoint do I need to use the Templates? All our templates are compatible with PowerPoint 2007 and later versions. Can I order and download more than one item at a time? Yes, our shopping cart facility allows you to select multiple items and to review the contents of your shopping card prior to proceeding to Checkout. When the order is processed you will receive one email per order with links to download each item you have purchased. We offer secure payment processing, using GeoTrust the industry leading provider of SSL secure encryption, to process payments using a variety of credit cards or PayPal. Is the Site and my Payment secure and safe? We use GeoTrust the industry leading provider of SSL secure encryption. Click on the GeoTrust symbol at the bottom of this page for details of our SSL security certificate. When you complete your purchases proceed to checkout, your payment either by credit card or PayPal will be processed. We use Stripe, the industry standard payment processor, for all credit card payments. is send immediately the payment is processed (usually instantaneously). Can I download my templates immediately? When you complete your purchases proceed to checkout, your payment either by credit card or PayPal will be processed. After the payment has been processed and validated, you receive two emails. 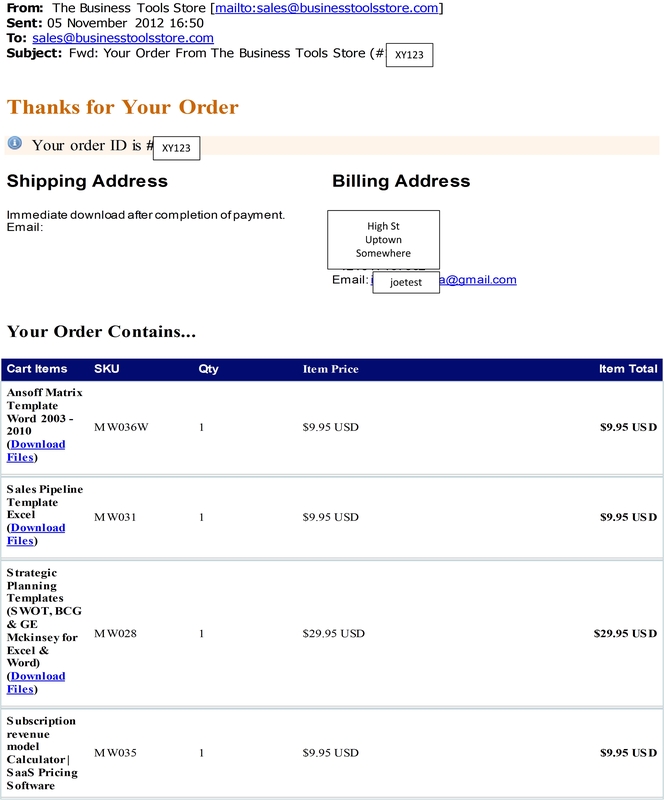 The first email is a receipt from the payment processor (PayPal or Stripe) confirming that the payment has been made. The second email is an invoice/receipt from the Business Tools Store. This email itemizes the products purchased and provides a direct link to download the template file(s). See example here. The download links can be found in the Cart Items section immediately after the product name. This link is unique to each customer and is sent immediately the payment is processed (usually instantaneously). If you do not see the emails in your inbox, you should check your SPAM/Junk folder. If I don't receive the email with the download link for my purchase. The emails are automatically issued once the payment has been processed. If you don't receive the download link email shortly after the payment has been processed please check your "SPAM/Junk mail" folder. If you have multiple email accounts, please ensure that you are checking the email account which you supplied with the order. If you still experience difficulty getting the download link,contact us. If you experience difficulty attempting to download your purchase. download. If you still experience difficulty contact us. I am experiencing difficulties running templates with Macros. Many of our templates use macros to provide a more user friendly experience. In Excel, you can set a macro security level to control what happens when you open a workbook that contains a macro. In Microsoft Office, a component checks files for macros that could be unsafe. If macro security is set to High, running this macro is disabled. If macro security is set to Medium, the user is asked whether or not to run macros. If macro security is set to Low, the macro is run. The default security setting is High when Excel is installed. It is recommended that you set it to medium. Depending on the Excel version rather than Medium you may be offered the option to "disable all macros with notification". If macro security is set to Medium or"disable all macros with notification", the user is asked whether or not to run macros. This level with not activate any macros without your specific approval. ends in .XLSM the spreadsheet contains macros and the macros should be enabled. Click the Excel File menu, and then click Options.